Three Scarborough Saturday League teams are hoping to beat the elements this week and claim wins in their respective NRCFA Saturday Challenge Cup quarter-finals. West Pier play host to Catterick Garrison Football Centre, and Andy Spivey's team will be aiming to return to winning form after drawing their previous league game 1-1 at Newlands and losing out 4-2 at Itis Itis Rovers the week before. These results have seen Pier's hopes of defending their Scarborough Saturday League title all but ended, so their focus will be firmly on the cup competitions now, as they are also in the quarter-finals of the League Cup and the final four of the Scarborough FA District Cup. Pier head to Snainton in the quarter-finals of the League Cup on Saturday February 23, 1.30pm ko, and three days earlier they meet Division One leaders Edgehill in the District Cup semi-final at the Flamingo Land Stadium, 7.45pm ko. Catterick have been inconsistent in the Wensleydale Creamery League this season, and are lying seventh out of 11 in the table, but are in fine recent form with 7-1 and 5-2 wins in their previous two matches. Itis Itis Rovers are also on their home turf on Saturday, against Wensleydale Creamery League leaders Unicorn. Mikey Barker's team have won one, against West Pier, drawn one 4-4 with Newlands, and lost three games since the Christmas break, so they will also be mainly focusing on the cup competitions for the rest of the season. Rovers are also in the quarter-finals of the League Cup, at home to second-placed Hunmanby United, on February 23, 1.30pm ko, and a week on Saturday they head to Seamer in the Harbour Cup semi-final, 2pm ko. Newlands have a tough trip to face North Riding League Division One title-chasers Thirsk Falcons in the other NRCFA Cup game. Martin Cappleman's troops are unbeaten in 2019, having won 4-2 at Goal Sports, drawn with Itis Itis, won 2-1 at Filey, followed by a draw with Pier, so they will be confident heading into Saturday's cup game. In the league, Edgehill can take another step closer to the Division One crown if they win at home to second-from-bottom Sherburn. A three-point haul for Steven Clegg's team would take them five points clear of second-placed Hunmanby United, and the pacesetters would still have a game in hand on United. Seamer's hopes of taking second spot could be boosted if they win at Filey Town. 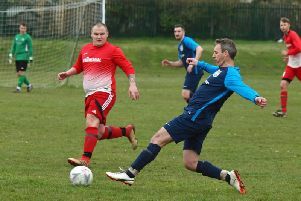 Edgehill Reserves are also in the driving seat for the Division Two title race, and can stay on track for glory if they win at home to lowly Fishburn Park on Saturday. West Pier Reserves' chances of keeping the pressure on Edgehill Reserves rely on them earning a home win against FC Rosette, while Ayton could maintain their promotion push with a win at third-placed Goldsborough United. Snainton host Eastfield Athletic on Saturday, with Cayton Athletic heading to Eastfield Town and Newlands Reserves head to Seamer Reserves. Eastfield Town v Cayton, Edgehill Reserves v Fishburn Park, Goldsborough v Ayton, Seamer Reserves v Newlands Reserves, Snainton v Eastfield Athletic, West Pier Reserves v FC Rosette.